Burlington / Labor Can a Judge Force an End to the CCTA Bus Strike? 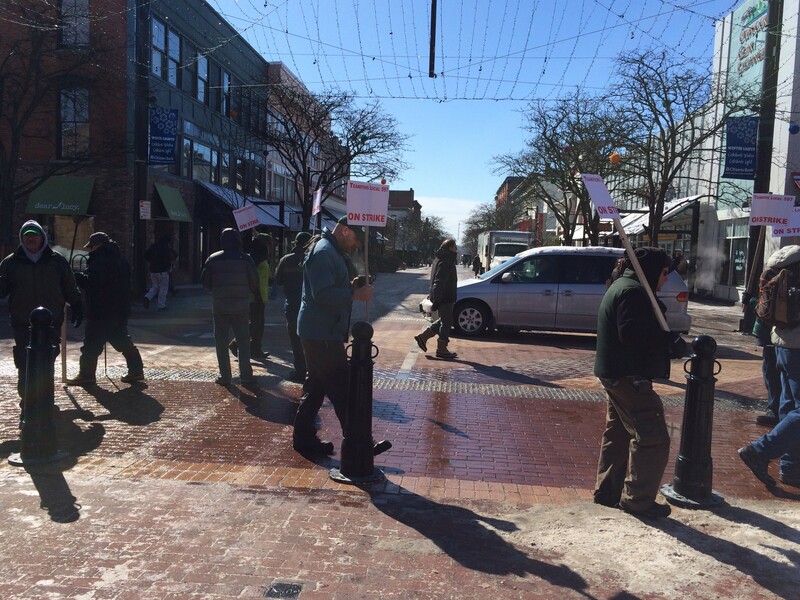 CCTA drivers and supporters have been picketing on Church Street since Monday. Thursday 2:25 p.m. update: Drivers' union presents counter-offer. If labor and management continue to bicker, can anyone force the Chittenden County Transportation Authority bus drivers’ strike to end? CCTA received a counteroffer from the union this morning and will likely meet with drivers this weekend, agency spokeswoman Meredith Birkett said. Birkett said the agency is reviewing the union's proposal this afternoon. If the two sides can't arrive at a negotiated settlement, there appear to be three potential paths to pushing the groups to settle a strike now moving into its fourth day. All have significant complications and are relatively untested. To begin with, experts say, there are two possible legal solutions: The Vermont Labor Relations Board or a Vermont Superior Court judge could be asked by one of the warring parties to intervene. And in the halls of state government, the Agency of Transportation — which provides much of CCTA’s funding — might be able to exercise a provision in its contract with the nonprofit bus agency to cancel the agreement and hire another entity to provide mass transit in Chittenden County. None of these alternatives is simple. But, then, neither is the CCTA strike, which is occuring under a little-tested state law governing labor disputes. Representatives from both CCTA and the union declined to discuss next steps, saying they were both hopeful that a negotiated agreement could be reached without outside interference. “I don’t want to rule anything out, but the focus is on ... resuming bargaining,” said CCTA General Manager Bill Watterson. Collective bargaining between the two parties? Five sessions were conducted — and no agreement was reached. Bargaining with the help of a federal mediator? Five more sessions were conducted with the mediator — still no agreement. Hiring a factfinder to make recommendations for a mutually agreeable deal? The parties spent several months agreeing on the factfinder, finally got his report, and could not come to terms. Entering into legally binding arbitration? The drivers have thus far refused. And that, essentially, is the end of the standard negotiating road. Further complicating matters, the drivers’ strike is all but unprecedented in recent decades. CCTA is considered a municipal entity under state labor law, and experts can't recall a municipal workers strike in Vermont in nearly 30 years. Employees of the Enosburg Falls Water and Light Department were fired after they walked off the job in 1985. The Labor Relations Board ultimately ruled in favor of the employees and, after an appeal went to the Vermont Supreme Court, most of the striking employees decided to return to work. The process took more than two years. Many municipalities, including Burlington, require parties to go to legally binding arbitration in the event of a labor dispute, making strikes all but impossible. But for CCTA arbitration is optional. Teachers, who strike more frequently, including in Rutland and Bennington, are not considered to be municipal organizations. They answer to a different state labor law. Experts can remember only one one municipal labor group that even came close to striking: The CCTA drivers, three years ago. After threatening to walk out, drivers reached an agreement at the last minute on a contract that expired last summer. The process of negotiating a fresh contract led to the current standoff. On the surface, such a claim could at least be plausible. The CCTA strike has stranded scores of lower income people who can’t afford a car or taxi to work, school and health care appointments. The HowardCenter, which treats patients grappling with substance abuse and mental illness, says it has experienced a spike in no-shows and cancelled appointments since the strike began. And there are countless stories of children and adults being forced to walk miles in the bitter cold to get to school and work. But experts say a party seeking court intervention would have to muster more than a collection of sad stories. Seven Days also spoke to five Vermont labor lawyers and mediators about the situation. Citing potential conflicts within the small field of contract dispute resolution, all spoke only on the condition of anonymity. Several said that, were CCTA officials to pursue an injunction, they would be better off waiting several days, to allow the case for a public safety threat to grow. “The longer the strike goes on, the better the case the municipality may be able to make,” said a veteran Vermont mediator. But there is little, if any, precedent for such a public safety injunction being issued under the municipal labor law. A more traditional route would be for either party to file a claim with the Vermont Labor Relations Board, an appointed body that resolves employer-employee disputes. The foundation of the claim would be, essentially, that the other party did not bargain in good faith. Tim Noonan, the longtime executive director of the Labor Relations Board, declined to comment on the CCTA strike, saying there is at least a chance that he could be asked to intervene. “We could get some action filed with us,” Noonan said. It takes a lot more than an impasse to show bad-faith bargaining. And it can be months after a complaint is filed with Labor Relations Board before a ruling is issued — rulings that can be appealed to the Vermont Supreme Court. Short of an outside authority issuing a ruling, there are economic and political pressures that could be brought to bear. CCTA is essentially VTrans’ designated provider of public transportation in the county. The agreement between the agencies requires CCTA to “remedy, with all reasonable dispatch,” a strike or other reason for a service interruption. If the VTrans believes that is not happening, Searles said it could consider ditching CCTA, hiring a private company, or bringing in another agency to provide at least some of the service CCTA delivers. But VTrans cannot boot CCTA simply because of a strike: The agreement specifically says that CCTA cannot be deemed in default because of a work stoppage. The bus agency simply has to be working diligently to a resolution. “If people are talking, then we call that ‘reasonable dispatch,’’” Searles said. Moreover, while VTrans can exert pressure on CCTA leadership, it is legally bound to respect workers’ rights to strike and cannot thrust itself directly into the negotiations.